How to delete photos from iPhone? Home » How to delete photos from iPhone? I bet every iPhone owner got the most annoying pop up “Cannot Take Photo. There is not enough storage to take a photo.” right when they were trying to take the best photo of their life. Solution? Delete photos from iPhone! In this article, you will learn 4 ways of mass deleting photos and videos from your device to free up storage on your iPhone. BONUS: CopyTrans Photo can even delete albums created with iTunes! Learn how to get rid of iPhone albums that won’t delete from the device. Run the program and connect your iPhone. The iPhone albums and photos appear in the left-hand side panel. Select the photos and videos you wish to delete from iPhone. 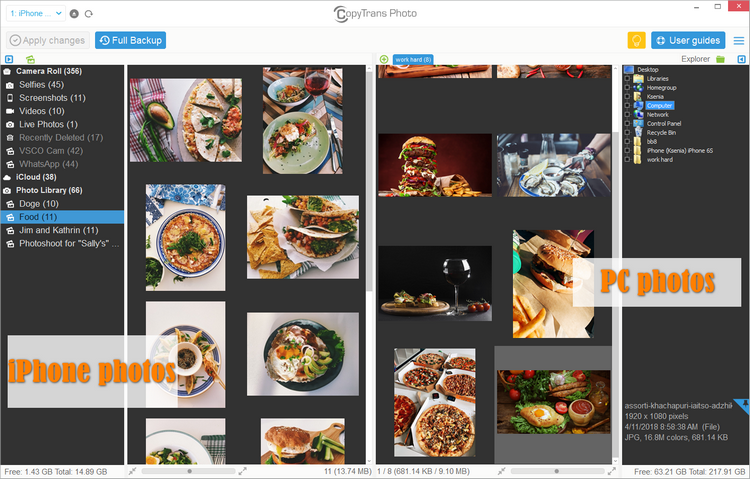 TIP: To select multiple photos press and hold the CTRL key then click on each photo. To select all photos from a given album, press CTRL + A.
Right-click on the photos and click “Delete”. Or use the “Delete” key. 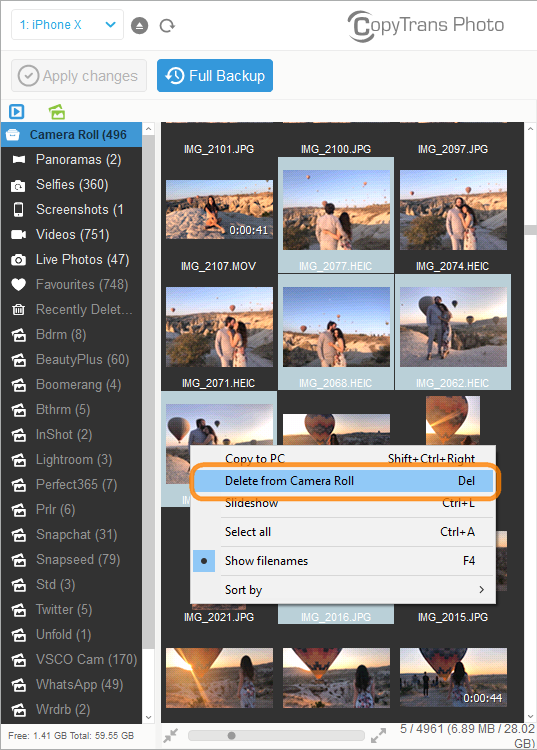 Click on the “Apply changes” button to permanently delete multiple photos from Camera Roll. 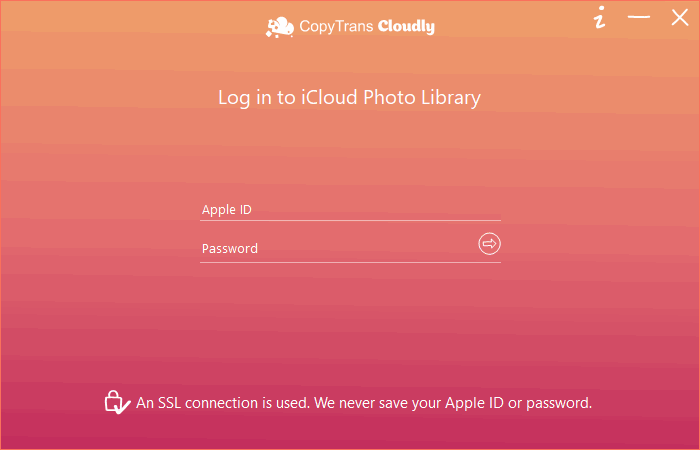 Unfortunately, CopyTrans Photo cannot delete photos from your iCloud Photo Library. But CopyTrans Cloudly sure can! 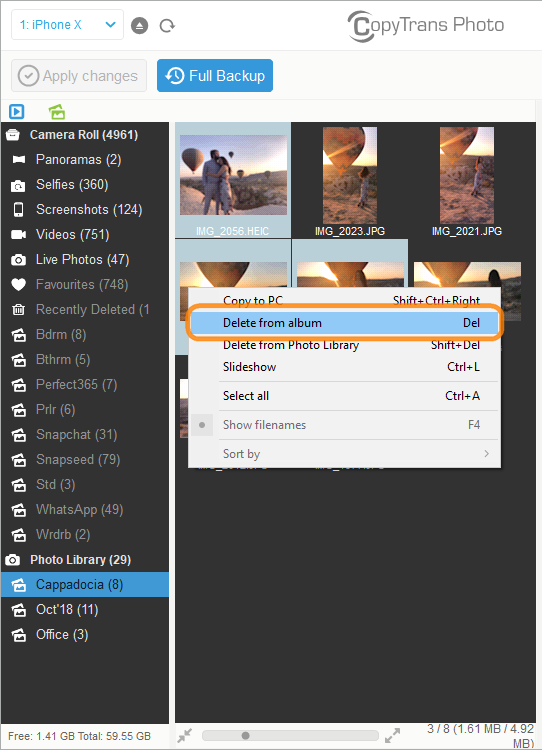 Head over to the cloud photos deletion tutorial. If you are in a hurry, you can always delete photos from Camera Roll on iPhone directly. It’s greatly explained on the official Apple website. not good to manage big libraries. Due to Apple limitation, you cannot delete photos from the albums that were added via iTunes or any other third-party app. 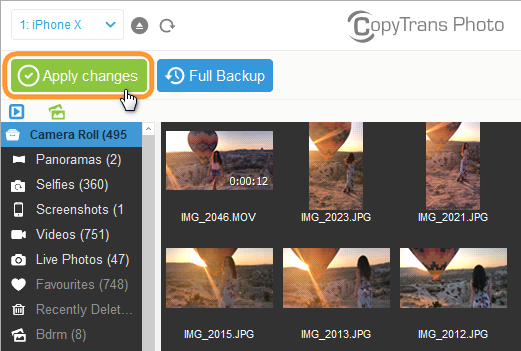 Thankfully, CopyTrans Photo can delete synced photos from iPhone in just a few steps. Connect your device. Your synced albums will appear on the left side of the interface, under the Photo Library category. To delete synced photos from iPhone, simply select them and press the “Delete” key on your keyboard. TIP: You can also delete entire albums. Once you are done, click on the “Apply changes” button to delete photos from synced albums. Log in to your account and wait until your iCloud Photo Library is loaded. Select the “Delete” option in the main menu to delete all photos from iCloud. Wait until the process is finished and feel free to take more photos. TIP: If you don’t want to lose those photos forever, simply back them up to your computer before deleting. If you have question or comments on how to delete photos from iPhone, feel free to leave a comment below!